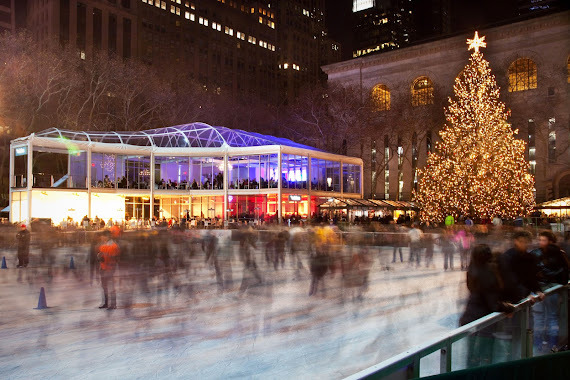 Though the Holiday Shops at Bank of America Winter Village have been packed away until next year this does not mean the end of winter fun at Bryant Park. The park will continue to provide fun and free activities for all ages; it’s just our way of keeping spirits high during the colder months of the year. Public parks are open year round and we are aware that the public is interested in being a part of the park snow or sunshine. First and foremost, The Rink will be open for another 2 months of triple axles, figure eights, brisk early mornings and romantic winter nights on the ice. As always, admission is free (but you can upgrade your experience) so you can glide your way into 2015. The park will also continue to offer rink rental for private events and skating packages for parties. Celsius and the tree's brilliance light up The Rink on a winter night. After you've worked up an appetite (or thirst!) head over to Celsius for delicious comfort food to warm you up, including a new ramen dish that is sure to please. It’s also a great place to grab a drink with a friend or colleague, as their drinks menu is quite extensive. With a view of the Rink, Celsius has curated the perfect atmosphere for a winter haven. 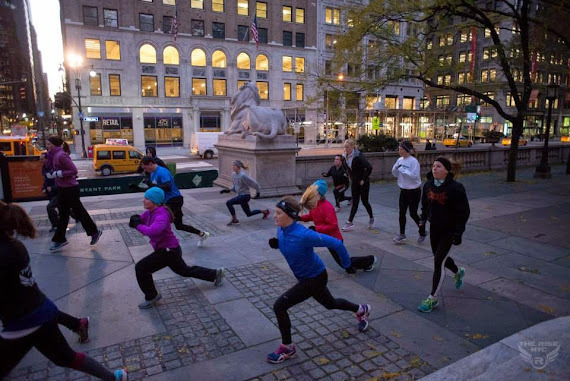 If you are looking for a more challenging activity, The Rise NYC will continue to lead Bryant Park FitClub each Wednesday so you can kick off hump-day feeling energized. We all make resolutions in the new year to live a healthier lifestyle so why not take advantage of something that costs you nothing but an early morning once a week? Early morning Risers participating in Bryant Park FitClub. 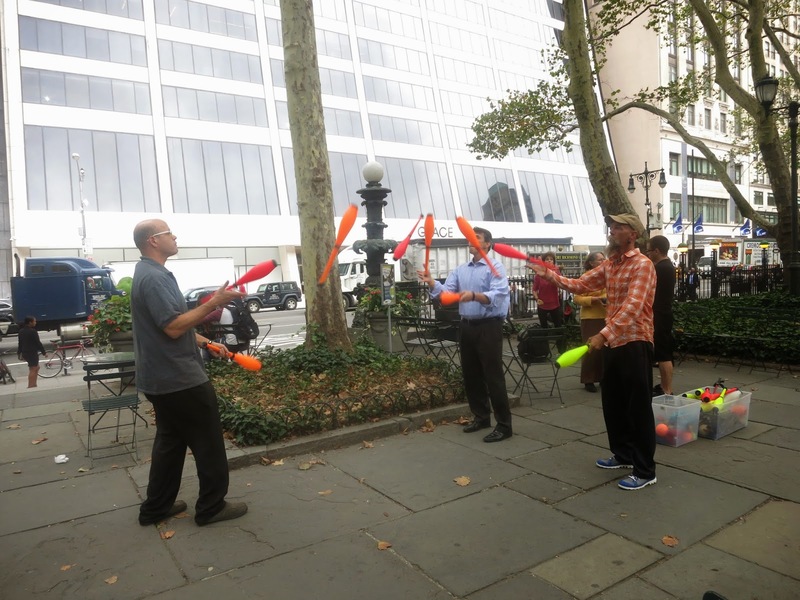 If the group work out on chilly winter mornings is not your thing, but you’re looking for any opportunity to meet new people and use your hands, Bryant Park juggling continues to meet every week, almost twice a day every day. This activity is fun for all ages and levels. Bring out your inner circus performer and clown around a little on the 42nd Street Plaza. For more information and pictures check out their blog. Bryant Park Jugglers juggling together in the 42nd Street Allée. 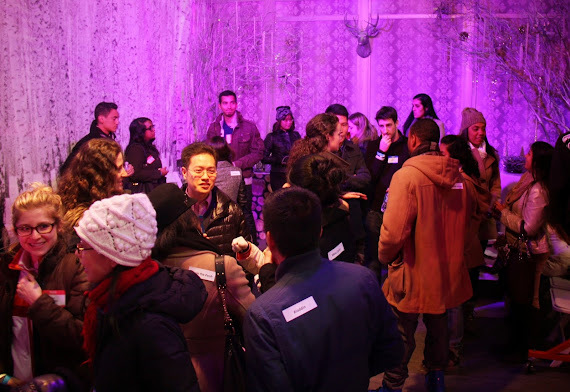 For the more intellectual Bryant Park enthusiast, Word for Word poetry is back for its second season at Kinokuniya Bookstore across the street from Bryant Park. The lineup will be outstanding thanks to our partners in publishing. The readings will take place every third Tuesday of every month through April 2015. Poet Ocean Vuong shares some of his poetry during the February 2014 Word for Word Poetry event. Finally, in true Bryant Park style, Winter Village will be hosting three events in the next couple months that you should be sure to add to your calendar: Winter Carnival, a Luminaires Skate Meet (our young professionals club), and the Kid’s Food Festival. Keep your eyes peeled and your ears open for more information on these upcoming special events.